If there’s a trend that has emerged as the grand tradition of the American CG feature, it’s that of the unlikely underdog transcending his nature. Little cleaning robots can alter the fate of humanity. An ant can shine as an individual. The evil mastermind can become a pleasant family man. So it’s probably not a huge surprise to anyone that eventually, a film was going to come out about a snail being able to go really, really, really fast. This is probably the most babyish of all the films made by Dreamworks Animation, who post-Shrek have tended to go for vaguely subversive and hip (Shark Tale, Monsters vs Aliens) or – my personal preferences – relatively epic and serious (How to Train Your Dragon, Rise of the Guardians). They probably need to veer towards the latter to finally shake off the Pixar-derivative tag, with this film having a whiff of A-Bug’s-Life-Meets-Cars about it. But there’s always a different flavour to the Dreamworks comedies that is a bit cheekier than anything from Pixar and less timeless and universal. And it’s in this frame of reference that Turbo succeeds – in being something a little by-the-numbers and uninspired, but very silly and very enjoyable. Ordinary garden snail Theo is unhappy. Though he works loyally in the tomato patch with the other snails – where death by crow is a sad everyday occurrence – at nights he watches videos of championship car racing and dreams of going fast. After a particularly bad day, he goes to watch the cars at the freeway and ends up managing to fall into the engine of a souped-up car during a street race. He is quite literally turbo-charged as he is caught by a flooding of nitrous oxide, which in an origin story worthy of Stan Lee for being half-baked and preposterous, this makes him not only able to travel at the speeds of a race car, but to gain other car features as well, like a radio, headlamp eyes and even a reversing beep. When his brother Chet is taken by the crows, Theo chases after them and rescues him. However, he is caught by a portly Mexican who enters him into a snail race outside his run-down taco stand. When he witnesses the absurd speed of Theo – now wanting to be known as ‘Turbo’ – Tito the cuddly Mexican realises that Turbo could be the key to revitalising their business. Theo himself, though, he has grander plans than a tourist attraction, and just might be able to convince Tito to get him entered into the Indianapolis 500, where he can meet his heroes. A very classic underdog story, there’s a lot about Turbo that is very obvious storytelling, but for me one big qualm at the centre. 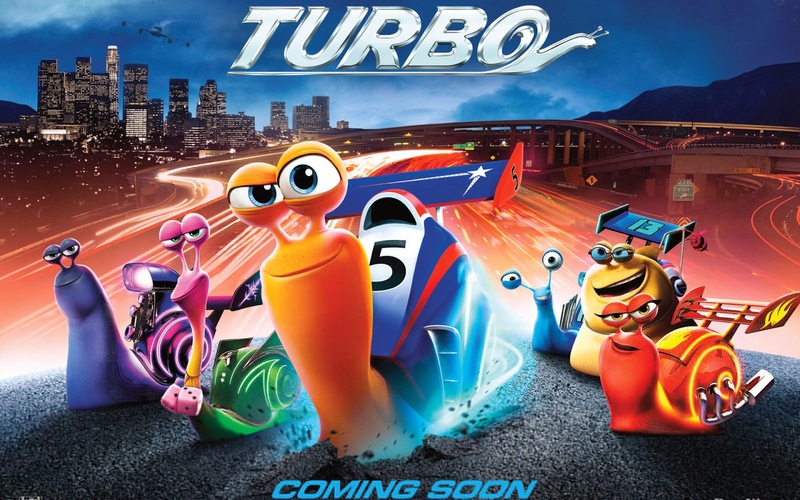 It seems strange for me that the film goes from ‘let’s enter a snail into the Indy 500 to get publicity for our taco stand’ to ‘Turbo must win or the whole thing is meaningless.’ Let’s face it, they got a snail into a major car race. There’s a montage depicting how Turbo goes viral online that’s crucial to the rest of the plot, which even includes a pastiche of Autotune the News-style Youtube compositions, which the composer must have had a whole lot of fun putting together. Surely that’s enough to make the taco stand incredibly famous? I can cope with the usual cartoon questions of ‘why isn’t the entire world wanting to experiment on/reproduce/analyse this incredible phenomenon? Doesn’t the way the snails are so obviously sapient change every human being’s outlook on other life on Earth?’ and suchlike, but that moral heart of the film, that the hero must actually win rather than just participating and perhaps more importantly that the unworthy rival must lose…that doesn’t sit well. There’s not much to say technically. Obviously, a huge amount of work went into Turbo, but it’s the same animation we are constantly seeing in CG animations these days. They’ve done a lot of work making such an unappealing creature as a snail look like a friendly cartoon character, with hints at chins in the shapes of the bodies, but these aren’t the first cute snails we’ve ever seen. Ryan Reynolds and Paul Giamatti are a spirited duo, and there’s no doubt that it’s a strange thrill to hear Samuel L. Jackson and Snoop Dogg collaborating as – of all things – a couple of badass snails, though it certainly feeds the notion that those two will do any roles these days. It probably won’t surprise or particularly delight anybody, but Turbo will entertain enough for it to be worthwhile giving it a try. As for the spin-off series…can’t say I feel much inclined to watch that any time soon.